Due to the impending new GDPR regulations, as a club, we need to ask permission ( called Double Opt In) from all of our members to allow us to communicate with them in the future. The new rules that come into place on May 25th require us as a club to have already sought permission from you for us to contact you for matters arising fromthe club, this can be anything from fixtures, game details and all social events, without your permission we will not be able to communicate with you. We therefore require all our members to fill in new membership forms as soon as possible, can you please click on the link below that will take you to our online Membership form. Please note, if you do not fill this form in we will not contact you in the future we will also remove any contact information we currently hold. Can you please fill the form in within the next 14 days of this post (Tuesday 3rd April 2018) - if we do not hear from you within this time we will remove your contact information. Sorry this sounds formal, however, we have a legal obligation to fulfil. It would be great if everyone could fill in the form, which takes about 2 mins. Standish Cricket Club are pleased to announce that Bott and Company Solicitors Limited, one of our long term sponsors, have generously confirmed a significant sponsorship for the coming season. Bott & Co is a multiple award-winning specialist no win no fee consumer rights solicitors firm based in Wilmslow, Cheshire with particular expertise in personal injury, flight delay and holiday illness claims. The company was founded in 2001 by David Bott, Paul Hinchliffe and Gary Froggatt and was one of the first law firms to be granted Alternative Business Structure (ABS). We employ over 120 staff and a quarter of those staff have received funding for training or career development from the company via The Bott Academy. The business had a turnover of £11.1m in 2015. This years cricket club AGM is on Monday 21st November for a prompt 8pm start. Please find attached an invite and nomination form containing all details. We continue to see many enhancements and changes, which effect the future of the club, and as in previous years with only a small number of dedicated members this remains a challenge. The club needs support and assistance from the wider membership and the greater community, and will only improve in both on the field activity and the social side if we get more active involvement from you. We would therefore encourage you to attend the AGM on the 21st and hear more about the future. It would be a welcome progression if you would assist in any small way in the running of the club. There is only so much effort the few committee members can provide. Please get involved, it's YOUR club, help it to develop and have fun socially. You will also note from the attachments that we need Committee members and officials. Please consider putting yourself forward for these positions. 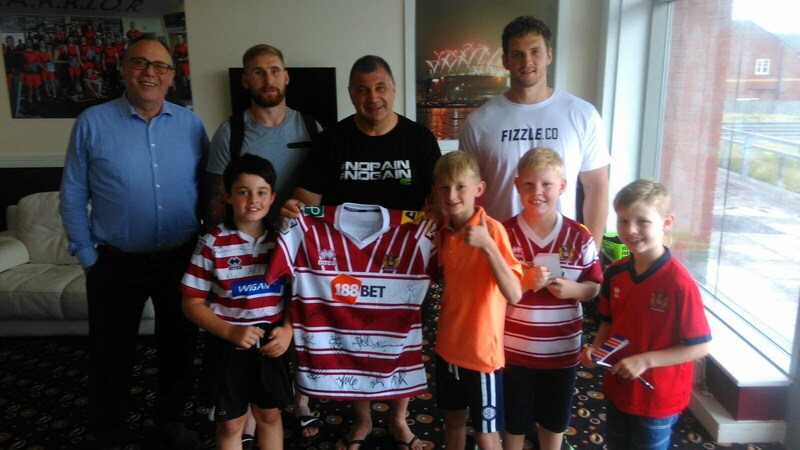 Thank you to Shaun Wane for presenting a signed Wigan Warriors shirt to Domonic Tonks. A prize kindly donated by Wigan Warriors to the Cricket Club at the recent Sportsmans dinner. Domonic is pictured with his Grandad, Michael Tonks of Tonks Shoes, Wigan, Shaun Wane, Sam Tomkins, Captain Sean O’Loughlin and friends. Open letter from the club Chairman. Most of you will be aware of the increased activities going on at the cricket club. We are trying to involve the local communities more, hold more social events, encourage people to come up for a drink on match days etc. We have purchased new equipment for the juniors, bought new nets, a bowling machine, plan to improve the ground and the outbuildings, car park, signage and general stuff in the club. After 25 years we are moving leagues from the Bolton league system to the Palace Shield which makes most of our matches around Preston/Chorley/Eccleston/Mawdsley/Rufford and Lancashire areas. There are a number of reasons behind the move but all around improving the Cricket experience and ensuring the financial security of the club for the future. Juniors will still continue to play in the Wigan District league so no change for them. We are always looking to recruit new players of all ages and ability, from the juniors age 4/5 upwards to senior players. We have 4 senior teams as well as juniors at all ages, although there seems to be a shortage in numbers of early teens. We have a number of local business who kindly support us, in many ways, including our local brewery, Prospect, whom provide us with their real ales, and we are extremely grateful to all of them. We have secured our first International sponsor, Standish Management, from the USA, who are sponsoring the scorebox on a five year deal, great news for the club. As you can imagine, all of this doesn't just ‘happen’ ! There are a number of people involved in the club who give up some of their time, voluntarily, to ensure the smooth running of all local events, functions, tea’s, groundwork, finances, coaching, bar, training and many other activities which take place every year. The club could do so much more and be integrated further within the community, as well as providing better facilities with the assistance and support of more people. I would urge anyone who is interested in the future of the club to get in touch and offer any time or help you are able to, in order to grow what we currently have. For those who have been to the club, I’m sure you will agree there is no nicer place to sit on a sunny day and have a beer or glass of wine. It isn’t long ago when most of Standish were appalled at the thought of houses being built on the site, with hundreds of people saying they love having the cricket club there and would be willing to support it. I can count on one hand, the actual people who have done something. It would be great to get some new people involved with ideas and suggestions of how to improve what we have. At the end of the day, it’s a 60 year old shed, which needs lots of work to keep going. We would all love to have a new clubhouse, but with the small number of people currently volunteering, it is always going to remain on a wish list. Please feel free to contact me by phone, text, email, if you would like to help out in any way or just to discuss anything. We would be happy to hear from anyone who can offer support in terms of time, financially or sponsorship. You don’t have to be a cricketer or a cricket fan, just the passion to want to keep the cricket where it is and grow it to something we can all be proud of in the community. 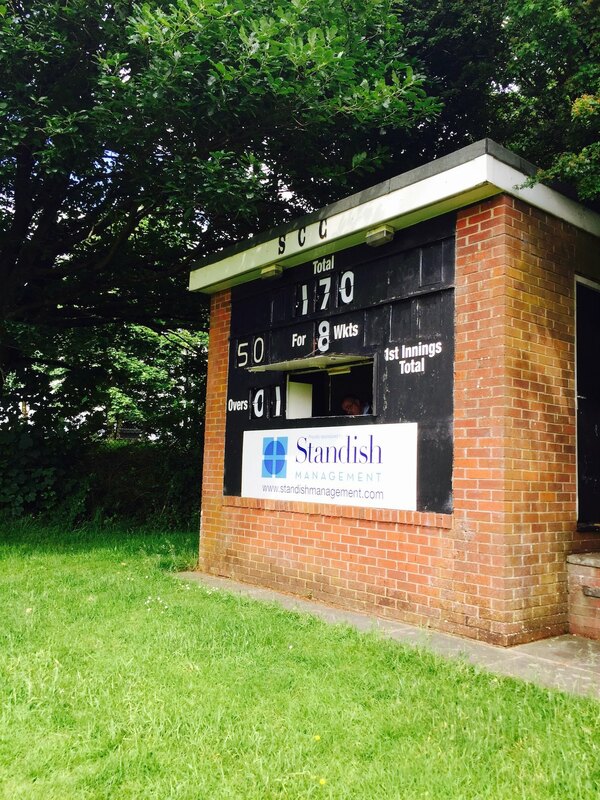 Standish Cricket Club are proud to show a picture of our Scoreboard sponsor our first international business based in the USA. Standish Management. Hair & Beauty Voucher, Beauty Products & Wine. Ticket number 02501, Mandy Stafford. Ticket number, 01024, John Fowler. Ticket number, 02235, John Marrow. Ticket number, 01322, Elliot Chapman. Ticket number, 00926, George Chadwick. Ticket number, 01148, M Vincent. A massive thank you to everyone who came to the beer festival over the weekend & a huge thanks to all the volunteers 'Beer Angels' for giving up your time and helping to make the festival the success that it was! Thank you also to all our sponsors without you all we simply could not host an event such as this. So on Saturday 16th April we will be getting the ground ready for the forthcoming junior and senior games. As usual there will be lots of odd jobs to be undertaken - painting, repairing etc. They say the more the merrier, and if we can get a good turnout it shouldnt take us too long at all. So please come along and help, even if you can spare just half an hour - your club needs you. Our Beer Festival is now just under 6 weeks away and we still need your help! The Beer Festival is one of the major fund raisers of the year, with profits made being put back into your club. Without such events the club would struggle to remain viable. We need the beer festival to be a success and for this to happen we need more volunteers to help over the weekend. This needn't be an onerous task as if we can get enough help the jobs can be shared equally, keeping everyone's commitment to a minimum, so everyone can enjoy the festival.